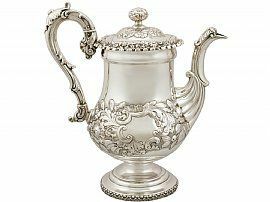 This exceptional antique George IV sterling silver coffee pot has a baluster shaped form onto a circular pedestal foot. The lower portion of the body is embellished with fine and impressive chased floral, foliate and scroll decoration, all on a matt background. The decoration to the body incorporates a shaped vacant cartouche to one side. The flared upper rim of the coffee pot is ornamented with an applied shaped leaf border accented with further floral and foliate designs. This sterling coffee pot fitted with a domed hinged cover encircled with chased decoration reflecting that of the body. The cover is surmounted with a fine and impressive sterling silver finial embellished with leaf designs in addition to a central quatrefoil motif. This impressive antique coffee pot is fitted with a scrolling sterling silver handle ornamented with fine and impressive embossed scrolling leaf decoration accented with a leaf and bead decorated thumbpiece. The upper and lower sockets of the handle are embellished with further impressive embossed scrolling leaf ornamentation. The circular spreading foot is encircled with a fine applied stylised Roman leaf decorated border. This antique coffee pot has an impressive scrolling swan necked spout embellished with embossed fluted decoration to the underside and a fine applied leaf design to the lip. This antique sterling coffee pot is an exceptional gauge of silver, exceptional quality and in exceptional presentation condition. The applied, embossed and chased decoration is all very sharp. Full hallmarks struck to the underside of the coffee pot and part hallmarks to the handle are all very clear. Length from back of handle to tip of spout 24.3cm/9.6"
Height to top of handle 26.5cm/10.4"